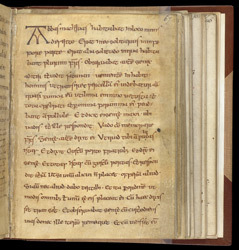 This collection includes a copy in Latin of the Parables of Solomon (Proverbs) in Latin with explanatory notes in Old English (glosses), a few writings by Alcuin (the late 8th to early 9th century Anglo-Saxon theological and liturgical expert working at Charlemagne's court), poetry in a Kentish dialect of Old English, and a paraphrase in Old English of Psalm 50. Such collections were the usual way in which the Bible would have been available to early medieval theologians. Single-volume copies of the Bible were rare: they would have been expensive and impractical. Copies of parts of the Bible, such as Psalms, the Pentateuch (first five books of the Old Testament), Gospels or Epistles would have been available for reading aloud at mass or other church services. Often books such as Proverbs were circulated as this one, bound with relevant theological writings to facilitate study. The manuscript bears the marks of many students in the form of study notes in its margins and extensive Old English glosses. It was used by the monks at St Augustine's, Canterbury, which already in the 10th century had a long tradition of theological learning. In the handwriting style often used in 9th- and 10th-century manuscripts for copies of biblical texts, theological writings and lives of saints, this page has the beginning of the 'Life of Macarius', a 4th-century hermit who founded a monastery in the Scetic desert of Egypt. Possibly the theme of personal quest for knowledge and wisdom links this life of an early Christian ascetic to the biblical, theological and poetic material in the collection. Parts of this copy of the 'Life of Macarius' have glosses in Old English written between the lines.